In addition to the pain caused to animals by the experiments, we should also take into account the significant suffering linked to the loss of liberty, the inability to meet the physical needs of their species, the mother-child separation and handling by technicians. Animals in laboratories are therefore also subject to stress and anxiety: we note for example that animals rescued from a laboratory shrivel terrorized in a corner of their cage at the mere sight of a white garment (which reminds them of the outfits worn by animal handles). Photos and illegal films, as well as the testimonies of people who have worked in these laboratories reveal cruelty nearly impossible for most of us to imagine and cause an increasing awareness and emotion within civil society who discover these abuses. In response, researchers who use animals now have recourse to new strategies to avoid having to defend the moral merits of this practice. Thus, ethics has appeared in the speech of the defenders of animal experimentation. 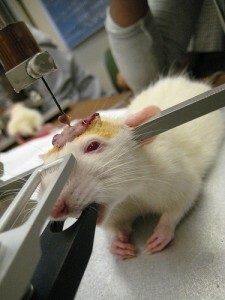 Ethics committees have been set up within laboratories to ensure for example the application of the rule of the 3Rs (“Refine” the experiment, “Reduce” the number of animals used, “Replace” tests on animals by other methods). Composed primarily of researchers working within the institutions involved and therefore ignorant of or hardly aware of alternative methods, these committees are by definition a further legitimization of animal experimentation, allowing it to continue. On the other hand, the concept of ‘wellness’ is very relative because adaptable from a human perception (larger cages, toys, anaesthesia…) and therefore still not allowing to call into question the plight of these animals, condemned in advance to suffering difficult to qualify or quantify, and ultimately certain death.